Constructed with heavy-duty melamine, this versatile 9-in. dinner plate from Carlisle's Dallas Ware collection is equally at home in casual restaurants, diners, cafeterias, and more! NSF approved and dishwasher safe, this classic dinner plate's sturdy design with reinforced rim and footed base will easily fit in with any of your existing dinnerware. 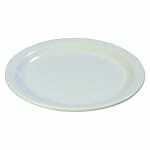 And, this melamine plate's classic white color is sure to provide a timeless appeal anywhere.